New. Trade paperback (US). Glued binding. 170 p. Contains: Illustrations, black & white. In Stock. 100% Money Back Guarantee. Brand New, Perfect Condition, allow 4-14 business days for standard shipping. To Alaska, Hawaii, U.S. protectorate, P.O. box, and APO/FPO addresses allow 4-28 business days for Standard shipping. No expedited shipping. All orders placed with expedited shipping will be cancelled. Over 3, 000, 000 happy customers. New. Trade paperback (US). Glued binding. 170 p. Contains: Illustrations, black & white. Fine. Trade paperback (US). Glued binding. 170 p. Contains: Illustrations, black & white. In Stock. 100% Money Back Guarantee. Brand New, Perfect Condition, allow 4-14 business days for standard shipping. To Alaska, Hawaii, U.S. protectorate, P.O. box, and APO/FPO addresses allow 4-28 business days for Standard shipping. No expedited shipping. All orders placed with expedited shipping will be cancelled. Over 3, 000, 000 happy customers. Tragedy and hope : a history of the world in our time. 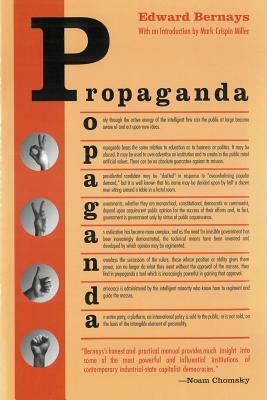 Bernays spells out his undemocratic vision for how democracies should be run: by manipulating the masses. This book went a long way towards my understanding of why people do things to hurt themselves and others while thinking that it's beneficial. I also recommend checking out the BBC's "Century of the Self." A facinating account by one who knew and performed the art of making people think this and that for various reasons. Reading this book may cause you to examine your believes and "needs" and decide whether they are genuinly yours or ideas imposed on you by someone else. Such knowledge is an important step to freedom.